NASA engineers pose with the James Webb Space Telescope shortly after its emergence from Chamber A, a giant vacuum chamber at the Johnson Space Center in Houston, on Dec. 1, 2017. 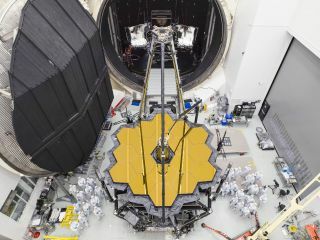 Part of NASA's next major observatory – the James Webb Space Telescope – just left a thermal vacuum chamber after about 100 days of cryogenic testing to prepare it for launch in 2019. With testing complete, NASA will study the results even as engineers prepare to put the telescope together, agency officials said in a statement. But that will require a move from Houston to Redondo Beach, California. Once the parts arrive at the Northrop Grumman Aerospace Systems facility there, the instruments and optics will be put together with the sunshield and spacecraft bus – completing the telescope's assembly. JWST will launch in spring 2019 from a European spaceport in French Guiana; in late September, NASA once again pushed back its expected launch date, due to integration issues. After launch, the telescope will journey to the sun-Earth Lagrange point 2, which is a gravitationally stable location 930,000 miles (1.5 million kilometers) from Earth. NASA's James Webb Space Telescope emerges from Chamber A at the Johnson Space Center in Houston on Dec. 1, 2017. The telescope will operate in infrared wavelengths and like its predecessor the Hubble Space Telescope, will have plenty of different science work to keep it busy. Some of JWST's missions include looking at the universe's first light, examining exoplanets and figuring out how galaxies assembled early in the universe's history. You can see the James Webb Space Telescope live here via NASA's Webb Cam camera.